Behind The Thrills | Harry Potter and the new wands-Could interactive wands be coming to Universal Orlando? Harry Potter and the new wands-Could interactive wands be coming to Universal Orlando? 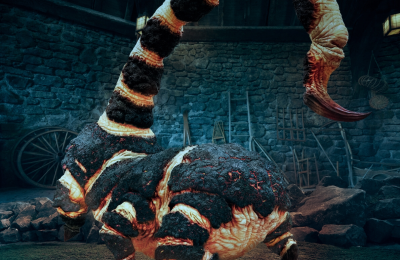 Harry Potter and the new wands-Could interactive wands be coming to Universal Orlando? When you get right down to it, The Wizarding World of Harry Potter is just about perfect. It looks identical to the films, it has the feel of magic hanging in the air, and Butterbeer is pretty addicting. 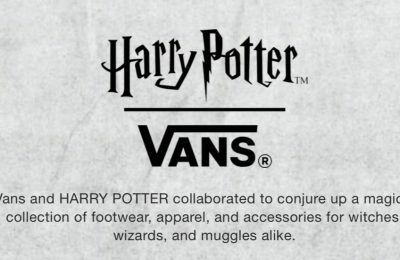 The one thing that is missing, however, are the real wands. Wouldn’t it be amazing if you could have duels in the street, or possibly cast spells on things in the shops? According to several rumors, it very well could be coming…soon. In fact, if interactive wands are coming, the magic may already be in place! According to a rumor that popped up on Orlando Weekly, (click here) Seth Kubersky theorizes about whether or not we’ll see new interactive features that will be used when guests “cast spells” using all new wands that can be purchased at the parks. Rumors of interactive wands are not new. In fact they’ve been floating around as far back as 2007 when The Wizarding World was announced. Back then it was rumored to use MagiQuest wands to interact with different things like elements in shops and queues. 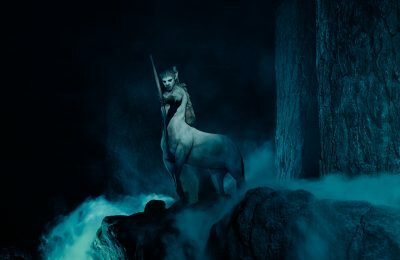 It was even rumored that there would be a ride in which elements could be activated using the special wands. Of course, none of that came true. The wands have remained just prop replicas for the most part, although right after opening wands with glowing tips were being sold in the park. It’s rumored that when Diagon Alley opens that the new area will be full of interactive elements which can only be activated using your specially purchased in park wands, as well as the right spell and a flick and swish. However, recent additions to the Wizarding World of Harry Potter at Islands of Adventure could indicate that the preparations are being made for the same kind of interactive features at that park as well. 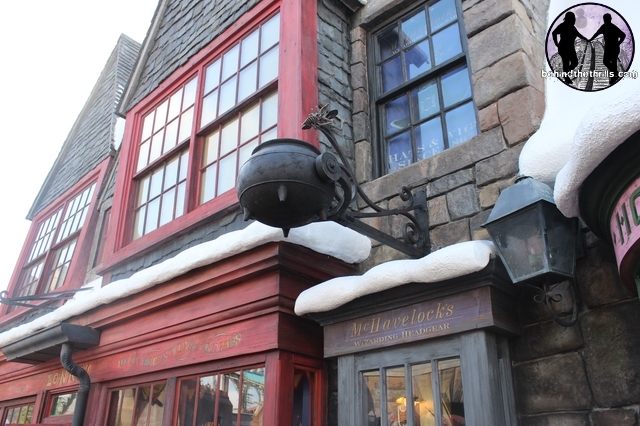 In the picture above, there is a new cauldron with a Cornish Pixie above the Mc Havelocks shop. It’s possible that with a flick of a new wand, guests could cause that cauldron to go spilling out, or to make the pixie light up. 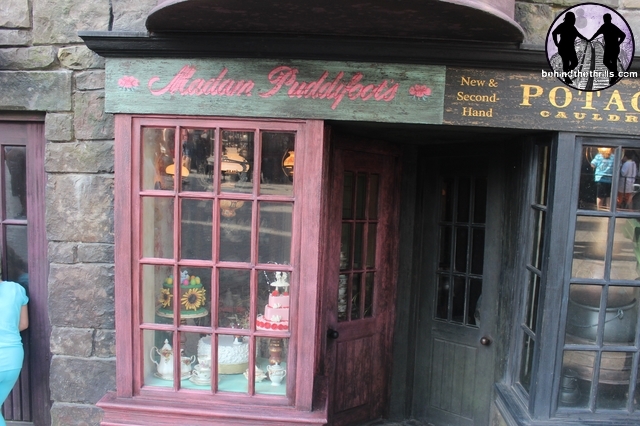 Another clue could be in the window of the all new Madam Puddifoot’s tea shop. Inside are several cakes, as well as a large stack of tea cups. Could we say a spell and have the cakes and cups move about in the shop? A very good possibility. None of this has been announced, and is just pure rumor and speculation at this point, but it very well could happen. What better opportunity to install interactive elements than during a changeover? Incidentally, the new shop was added because the shop that was there before will be an actual shop that will be used in Diagon Alley at Universal Studios Florida. Currently guests can purchase movie replica wands at Universal Orlando. The high quality resin wands are exact replicas of the wands of all major characters, including Dumbledore and Harry Potter. The wands cost around $35 dollars. If you want to start practicing before you head to The Wizarding World, wands can be purchased at Universal’s online store (click here). While we know quite a few details about The Wizarding World of Harry Potter-Diagon Alley, we are missing one HUGE detail. The opening date. Rumor has the new area of Universal Studios Florida open and ready to go in mid-June, which would be close to the four year anniversary of the original Wizarding World of Harry Potter at Islands of Adventure. The new area will feature new shops and restaurants, including a larger Ollivander’s wand shop, as well as an all new ice cream shop with unique flavors. Zonko’s Joke Shop in Hogsmeade was closed (click here to see before and after shots) The key new attractions will be the Escape from Gringott’s ride, as well as the Hogwarts Express, which will take guests from platform 9 3/4 at Kings Cross in London all the way through the countryside and Hogsmeade Station. Universal is becoming an even larger vacation destination as they’ve added not only more Harry Potter, but also the all new Cabana Bay Beach Hotel and all new CityWalk venues (with both to be completed this summer) in 2014. In 2013 Universal Studios Florida unleashed Transformers on Central Florida, and in 2012 the park unveiled Despicable Me:Minion Mayhem, Superstar Parade, and Cinematic Spectacular. Universal is changing the look of it’s park more than any other theme park in Central Florida, and in the theme park industry, giving visitors reasons to come back on a yearly basis. Stay tuned for more about The Wizarding World of Harry Potter at Universal Orlando, and be sure to follow along with us on Twitter @BehindThrills for the latest updates! For more information about The Wizarding World of Harry Potter at Universal Orlando, including tickets, visit the official website by clicking here!